Judging by the amount of searches done for the term “speed test” there seems to be a bit of an obsession with Internet speeds. There are many online test tools that allow you to check your upload and download speeds. Does Internet speeds vary throughout the day. Is it worth changing providers to get a faster internet connection? Internet speed tests will give you an upload speed and download speed. Usually the download speed is much greater than the upload speed (ADSL). This is usually OK because for most people they download much more than they upload. Download speed tests work by transferring a file of a known size from a test server located on the Internet to your computer, and measuring how long it takes. A 4 MB file will take 8 secs over a 4 Mbits/s link and 2 seconds over a 16 Mbits/s link. (see Bits and Bytes). The upload speed is measured by uploading a file from your PC to the test server and again measuring the time taken. The location of your destination server or service. They all combine together to form a chain (communications link) . 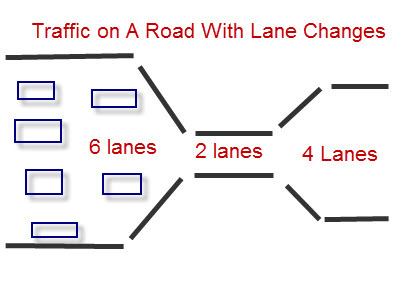 As a comparison, If you imagine traffic driving down a 6 lane road, which becomes a 2 lane road and.then a 4 lane road. (image Below). You can see that the traffic will be restricted by the 2 lane road. On the Internet, just like on a normal road, your final speed will be limited by the slowest link in the chain. Note: You do not need to install any software on your computer to do a Internet speed test. Be very wary when using speed test sites as some with prompt you to install software to improve your computer speed. Some probably are genuine, but it is impossible to tell, so I wouldn’t do it. This is the most important factor as far as internet access speed is concerned. All technologies have limitations. The connection speeds of fiber broadband is far superior to 3G mobile. You connect to your ISP (using an access method e.g. ADSL Broadband) and your ISP then connects to the Internet. 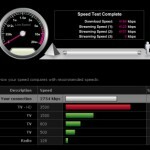 ISPs advertise the connection speeds to the subscriber, and not the speeds between the subscriber and the Internet. In the UK the connection to the home is almost always a BT phone line and ADSL, but fibre is becoming increasing popular. If that is the case then The access speed will be limited by these BT lines regardless of the ISP you choose. However that doesn’t mean that all providers will provide the same overall connection quality as-. The connection between the ISP and the Internet is usually over fiber and is fast, but it is shared by many subscribers. Therefore if the ISP overloads the link to the Internet it slows the connection from subscriber to Internet. So your Connection to the ISP could be 6Mbits/s but from you to the Internet it could be only 3 Mbits/s. Almost half of broadband users are now on packages with advertised speeds above 10Mbps but the average broadband speed is 6.8Mbps according to Ofcom. 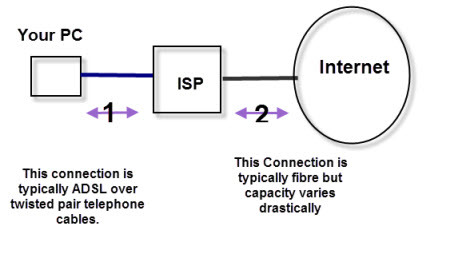 The Internet comprises a vast network on interconnected computers and networking equipment e.g routers (diagram below). 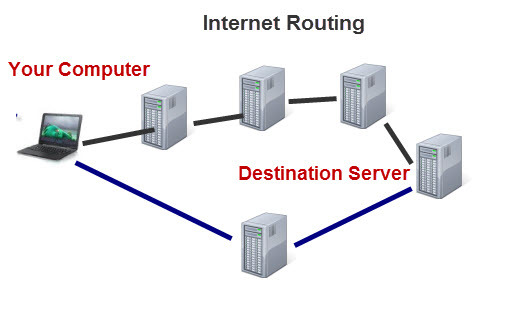 The number of routers/servers that the data must travel through on the way to and from the destination service/server will affect the overall speed. In addition the speed and capacity of the network that inter-links these computers/routers will also affect the final connection speed. In general the Internet itself will often be the limiting factor that affects your overall internet speed. So you may have a super fast connection to the Internet, but still take the same amount of time to download a file from the Internet as someone with a much slower Internet connection. You may have noticed that the Internet appears to slow at certain times of day. This is very similar to rush hour on the roads. 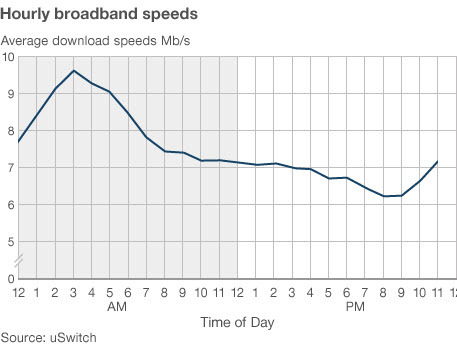 Here is a uswitch graph showing Internet speeds in the UK over the day. The worst time to be surfing the net is between 7pm and 9pm. When doing speed tests it is a good idea to do several over the course or a normal day. When you view a website with a web browser you are downloading information from the Internet. Most people spend most of the time surfing the Internet, and downloading information, which is why the download speed is usually more important than the upload speed. It is the speed that broadband providers usually display, and what people compare. 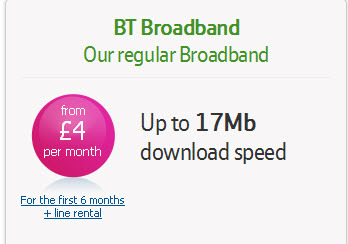 Here is a screen shot of the standard BT broadband package, and notice there is no mention of the upload speed. If you send email then that email is uploaded from your PC to the Internet. If you post pictures or videos on YouTube or Facebook then those pictures/images are uploaded to the Internet. How long that takes will depend on the upload speed of your connection. Most broadband packages provide broadband over telephone lines, and use a technology called ADSL (Asynchronous Digital Subscriber Line ) which has a much faster download speed than upload speed. Notice that the upload speed is 21 times slower than the download speed. This means that a file that could be downloaded from the internet in 30 minutes would take over 10 hours to upload to the Internet. Most Internet users aren’t currently interested in uploading files to the Internet, but with the growth in popularity of online storage there could be a increase in demand for much faster upload speeds. 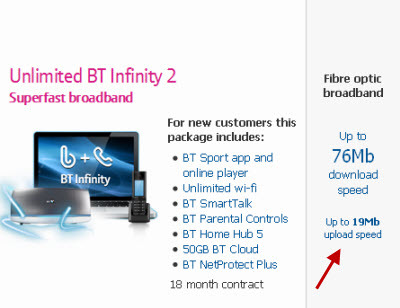 The screen shot below shows the BT Infinity package with a download speed (76Mb) , which 4 times faster than the upload speed (19Mb). If you are considering using the Internet for transferring large files then you should look for a broadband package that offers fast upload speeds. What is a Good Upload or Download Speed? This really depends on what you want to do with the Internet connection. If you want to download and stream movies then a minimum of 4Mbps is needed. If there are several people in your household that also watch movies online then you would want a little more speed. The best indicator of slow network speeds is obtained by using the Internet. If you find that that web pages take a long time to load, and movies take a long time to buffer, then you should check your speed. An easier check is to check your ISP advertised speeds against your own speed. You might find that you are paying a premium for a package because of the advertised speed but it is impossible for you to get those speeds because of your location. Speed tests are useful for checking that you aren’t paying for a connection that you aren’t getting. However your connection speed is only one part of the overall Internet connection, and you are unlikely to notice the difference between a 10Mbit/s connection and a 6Mbit/s connection when watching, for example, a YouTube video. The more people you have accessing the Internet through your connection the more important your connection speed becomes. A byte has 8 bits. The size of files stored on your computer is measured in bytes. 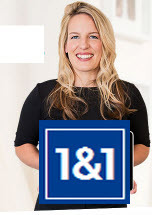 1KB =1 kilo Bytes =1,000 Bytes and 1MB=1 Million Bytes. Notice bits has small b and bytes a large B.
Q- I measured by upload and download speeds and they are very different to what the broadband provider advertised. Is this normal? A- Yes. ISPs usually quote the best speeds possible in theory, but not in practice. Q- I measured by download speed and it is XMbps is it fast enough? A- It depends on what you do, or want to do with the connection and how many people use the connection. Generally speeds above 6-8 Mbps will be good for most applications. Q- My Internet connection is slow what is the reason? A- It is difficult to say for sure. It could be your connection to your ISP or it could be the Internet. If you check your connection and find that your download speed is around 6Mbps or faster then it is likely to be the Internet. Q- Is it worth changing providers to get a faster internet connection? A- Because of the way broadband is provided it is usually better to try changing the access method i.e. go to fiber instead of ADSL. Q- Can my Wi-Fi be responsible for my low speeds? Q- I am using Cloud storage for backing up data what should I check? A- You need to check your upload speed. Generally only fibre broadband supplies good upload speeds. Q- Is 6 Mbps fast? A- You can judge it’s speed by how long it takes to transfer data. A 6 MB file will take 8 secs over a 6 Mbits/s. A standard 1GB movie will take about 22 minutes to download at 6Mbps. Q- What is more important upload speed or download speed? A- For most people it will be the download speed as most people will be browsing the web downloading movies etc.